I always wondered whether there was a specific way to get a head tattoo properly stencilled but Dennis demonstrated yesterday that there is no such thing as a ‘standard’ way. So he took Lesley outside and drew some more lines on her head while we chilled out and watched bicycles and boats pass us by in our beloved city of Amsterdam. It’s a very cool mandala design and sacred geometry / dotwork tattoos have always been fascinating to draw and they resonate well on almost any body part. 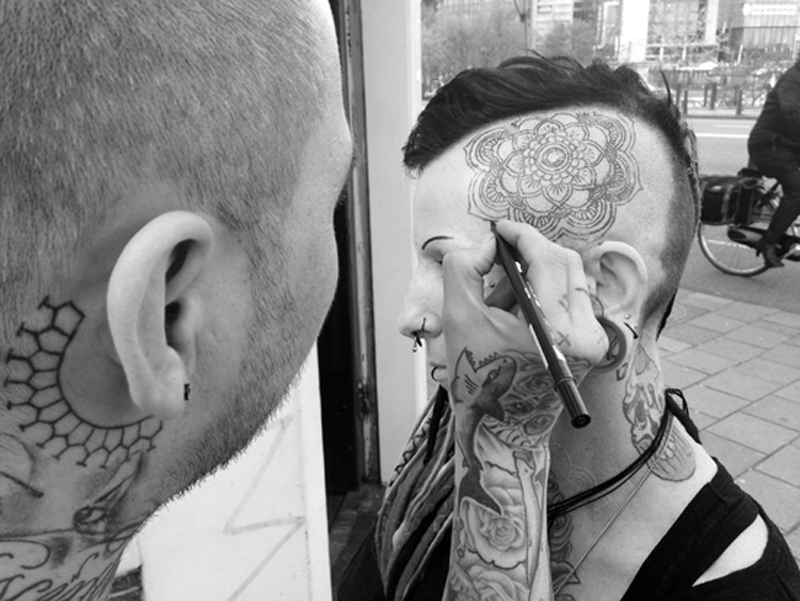 A head tattoo is ‘slightly’ different from any other part of the body since a lot of nerves are running up and down that area and Lesley could feel tiny buzzes in her foot when a nerve collided with the needle. Still I think she did pretty well (“sat like a champ” as they like to say) and she would zone out every now and then to take her mind away from the pain. Maybe the intensity of dotwork is different from pulling a straight line or shading like we normally would do in tattooing since dots mean single small points that build up to one big filled area and the sting of a small dot compared to pulling a big line takes away some of the stress on the skin and therefore making the tattoo session more doable. Still, this was one tough session and Lesley did super well, never complaining, and she was pretty stoked about it all when she saw the finished tatttoo. Hi what tattoo shop is this? Hi Jay, we currently work at different shops, this tattoo was done at Walls & Skin in Amsterdam. You can contact Dennis or me via info@www.jamesnidecker.com.mdurl.nl if you’re interested in a tattoo.